The answer to this question is not always a simple one, it likely comes down to these factors: the equipment you need, the amount of customization you need, the number of observers that want to participate and how much of a hassle you want to deal with. Running qualitative research in a conference room is definitely a viable option and can sometimes mean the difference between running research or not running it when budgets are tight. In those cases, I say go for it! Better to get some research done than none at all. But let’s talk a bit about why you might want to forego the conference room and rent a fully equipped lab. The audio/video equipment you need can play a big part in this decision. If you know that it’s going to be important to capture a lot of high quality video to share with stakeholders (e.g. multiple angles, facial expressions or high zoom) it may be difficult to do that with portable handheld equipment. During a recent study we hosted, we had a client that had multiple stations setup and needed the flexibility to get cameras on each station with high zoom capability. This was easily accomplished with ceiling-mounted, high resolution, movable cameras and the cameras could be adjusted without the participant even knowing allowing for an uninterrupted session. Sometimes the amount of customization a study requires is not contained to just the A/V equipment. 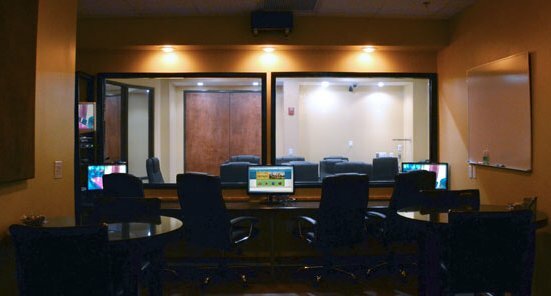 Sometimes a study requires that the participant room be transformed into the space where the participant will be using the product being tested. For example, you might want to test a home-use medical device in the comfort of a living room environment or a new server design in a replica of a datacenter. This would be difficult to do in a conference room that may just have a conference table and chairs. In a fully-equipped research facility you would have multiple options for creating the environment you need to make the product experience more like the real-world use. The next thing to consider is how many of your stakeholders want to be involved in watching the research live. Sometimes this is incredibly important as clients try to get buy-in from key team members. We have had up to 12 observers “behind the glass” for a study with several more watching a live stream from the comfort of their desk. This allowed for team members to discuss participant feedback as they heard it and even start drawing modified product designs real-time on the whiteboard. With two-way mirrors and live streaming capability you can make the research an engaging experience for your stakeholders and team members. The final point of consideration when trying to decide where to hold your research encompasses all of the points above…how much of a hassle do you want to deal with? You can do a lot with a conference room if you are willing to put the time and energy into it. But we find that many of our clients are coming to us because they don’t have this kind of time, they want to know that their research needs are going to be met with as little stress as possible. They are able to do this by renting our facility and letting us take that burden on for them. By the time they arrive for the study, the equipment is setup, the room has been transformed and observer viewing is ready to go. So the next time you are considering where to hold your research study, take these factors into consideration. It’s not always necessary to run in a formal lab but sometimes it can just make your job a lot easier.